Welcome to Texas’ premier Moto Guzzi and BMW Independent service center, specializing in the service, care and repair of your Moto Guzzi or BMW motorcycle. Moto Guzzi motorcycles are not only our specialty, but our passion. 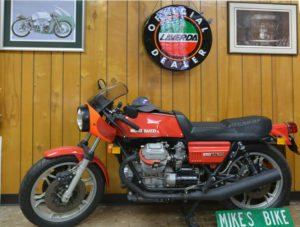 MPH owner Mike Haven has been riding and servicing the Moto Guzzi brand since the 1980’s. For decades, MPH Cycles has serviced the finest European motorcycles, providing hard-to-find expertise in Moto Guzzi and BMW maintenance, care and repair. Come experience why we were Texas’ #1 Moto Guzzi dealer since 2000 until 2016, and recognized as a Nationally and Internationally-known repair facility for European motorcycles. MPH Cycles is dedicated to providing motorcycle enthusiasts the opportunity to receive the best Service and Repair of your Moto Guzzi, BMW and European bikes from an experienced and knowledgeable craftsman, Mike Haven. MPH Cycles is confident that our service department is second to none. Why settle for inexperienced or uncaring service centers? MPH Cycles provides excellent service long after your motorcycle purchase.